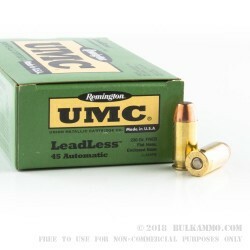 Called the “Leadless”, this is a nice target round at a decent price point that offers many shooter enhancement benefits for the .45 shooters out there. It is meant to come in line with the changes for lead exposure that have come online in the past few years in many areas. It prevents the hot gases from coming in contact with the lead core of a projectile (this projectile is actually lead free also), and the lead-free primer keeps extra airborne lead out of the shooting environment. The clean shooting benefits of this round are most obvious when shooting in an indoor range as the cloudy smoke-filled area you’d normally be shooting in, is suddenly much more enjoyable and the accuracy, reliability and performance are still good. Remington has reconstituted the UMC brand as a value line as it has in the past many times throughout its storied history. That history, going back to 1912 has been beneficial for the Remington brand and the shooters who rely on it for value priced ammunition through the UMC line. The name is synonymous with high quality and reliability at reasonable price points. This is a “hardball” round with a flat nose, essentially a 230 grain projectile with a stout powder charge. Q: The box picture says leadless...what is the primary componant of the round? 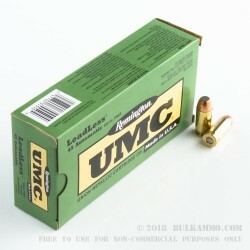 Also, at 230 gr, what difference ballistically can I expect from a 230 gr lead round? A: The name is LeadLess, which might lead you to think that the bullet was lead-free, but it is not. 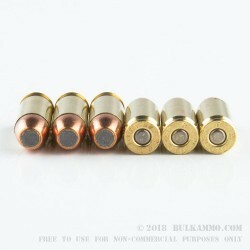 Traditional FMJ bullets have the jacket starting at the nose of the bullet and coming to an end at the base, with the lead core exposed at that point. 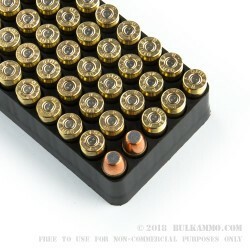 These bullets have the jacket beginning at the base and coming to an end at the nose, with the lead core exposed at that point. The idea is that the traditional bullet design allows lead to be vaporized by the expanding gases which come in to contact with the core, while the FNEB bullet prevents this from occurring because the jacket is essentially "on backwards." In addition, the load has a lead-free primer, which also cuts down on shooter exposure to heavy metals. It would perform identically to a 230gr FMJ lead core bullet from an external ballistics standpoint.